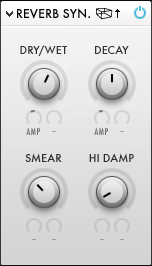 NI Razor has been a welcome addition to many musicians, producers and sound design enthusiasts who use Reaktor, and for many good reasons! This quick tutorial will walk you through the steps of designing a lethal pitch drop lazer bass with NI Razor. When using Razor in NI Reaktor, it can take a few sessions to become familiar and comfortable with the way it works and begin building your own workflows. That’s why lessons like this one are great for users of all levels, as it shares many of the key features of Razor and it provides insights into how they can be used. 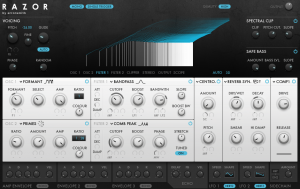 If you are brand new to Razor, you should definitely check out some of our other tutorials focused on this great synth. But in the meantime, let’s jump into this tutorial and see how to make this sound! We start making this lazer bass with NI Razor by dropping the pitch of the synth two octaves, as this will be a bass synth that we make. A Pitchbend controller will be assigned to modulate the pitch parameter of the synth, which is really only applicable if you are going to use a MIDI controller with this sound. I personally like the option. The Glide, Phase and Random parameters have all been tweaked a bit to change the delivery of the sound. (These values where decided upon after the sound was basically complete, but shown early on here to help maintain flow and keep this tutorial easy to follow. A Formant waveform is loaded into the OSC1 panel, and Filter1 is assigned to modulate the Formant knob. Filter1 still needs to be set up in this instance, but I have a good idea of how much modulation is going to be needed. A Primes waveform is then loaded into the OSC2 panel. Now it’s time to set up Filter1, which was already assigned to control the Formant knob of OSC1. Here we load a Bandpass filter. To achieve the right effect, a few controllers need to be set up and assigned to modulate some of the parameters of this filter. The main Amp Envelope is set up and assigned to modulate the Cutoff and Bandwidth knobs, while LFO1 and LFO2 are set up and assigned to control the Boost and Bandwidth knobs, respectively. Now a Comb Peak filter is loaded into the Filter2 panel. The main Amp Envelope is used again here to modulate the Cutoff knob. And the Mod Wheel of a MIDI controller is assigned to control the Phase knob (Much like the Pitchbend setting earlier in the tutorial, this one is optional). A Centroid unit is now added to the mix. The main Amp Envelope is used again here to control the Pitch knob, while a Sidechain is set up and assigned to control the Amount knob. (You can see the Sidechain set up in the second image shown after step four.) It is what provides a lot of the character and is a key ingredient for making this lazer bass with NI Razor. 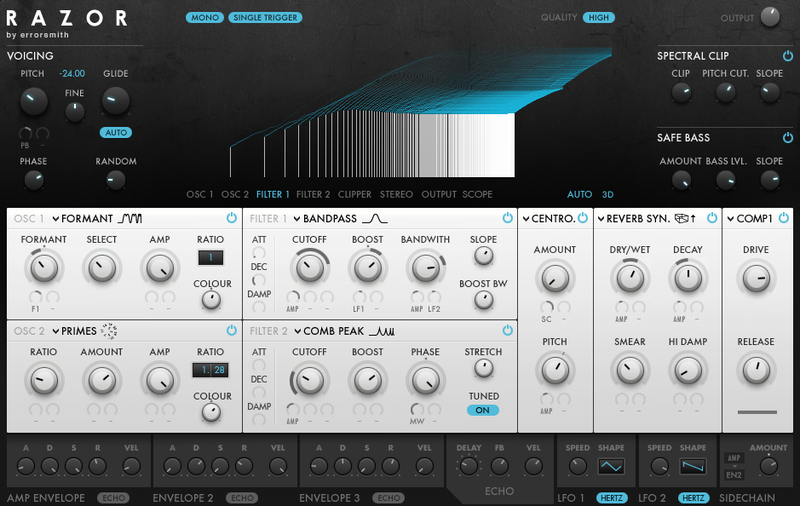 A Synced Reverb unit is now added to give the sound more room to move around in. A Compressor is also added to help shape the sound’s delivery. 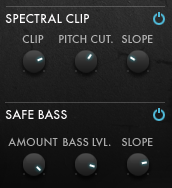 The Spectral Clip and Safe Bass features are set up now. This is the last of the shaping that needs to be done to this sound and it wraps up our tutorial on how to design a pitch drop lazer bass with NI Razor. Below is a small audio sample of our bass playing alongside some drums to give you a good idea of how it fit in a mix.